All sorts of yumminess in one dish. One of the things that I like about this salad is its flexibility in serving temperature. Make it early in the day and let it hang out in the fridge until dinner, and it’s delicious as a chilled salad. Make it when you get home and serve it right away, and it’s a delicious warm salad. Because it can be served at either temperature, it adjusts to your schedule or, for me, the weather. Right now, with spring beginning to show its face, this salad would be perfect served warm. As the day cools down, a room temperature dish sounds about right. To learn more about this recipe first published in June 2014, keep reading. Kale and quinoa are both newer to me ingredients. I have cooked with both of them for only a handful of years. As they are more recent additions to my cooking repertoire, I always am seeking new ways to utilize them. This salad was a fabulous discovery, as it included both ingredients, not only in one meal but in one dish! Depending on how much time you have you can make this salad and serve it immediately as a room temperature dish. If you have a little bit of time or want to make this in the morning before beginning your day, it presents just as well as a cold salad. For me this salad works quite nicely as an entrée. If you have a heartier appetite, as do my 18 year old son and husband, steamed shrimp or a grilled chicken breast makes a fine protein to serve atop the salad or on the side. Almost any protein would coordinate well with this salad; just choose what makes your family happy. Dice leaves and smaller stems. Add quinoa and 1-1/2 cups water to a medium-sized stockpot. When water begins to boil reduce to a simmer, cover, and cook for 10 minutes. Stir, re-cover, and cook for 5 minutes. Check the texture of quinoa. If too firm, add a couple tablespoons of water and cook for a few more minutes. While kale and quinoa cook, combine vinegar and sugar in a small bowl. Microwave for 15 seconds, then stir until sugar dissolves. Add shallot; leave in bowl for 15 minutes. 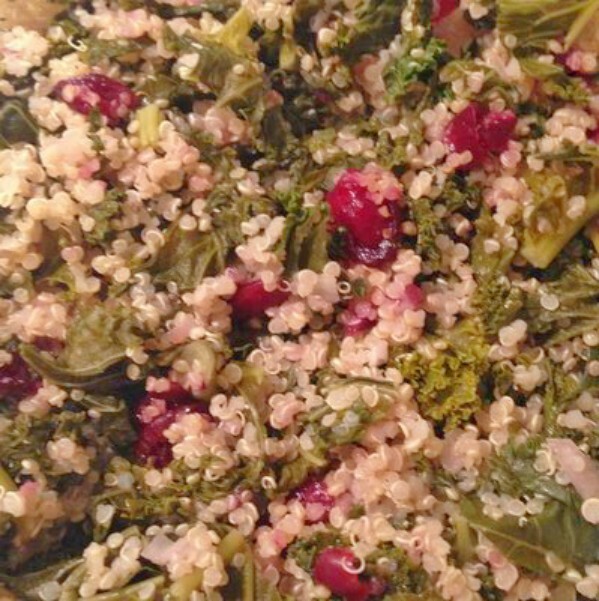 When kale and quinoa are cooked add shallot and vinegar mixture and cranberries. Stir well to combine. Season with salt and pepper to taste. *Save for Pickled Kale Spears recipe.